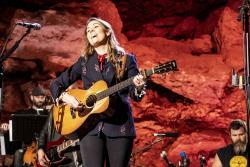 From Bluegrass Underground’s new subterranean home within The Caverns, PBS Arts presents a very special performance by the amazing Brandi Carlile and her band. With the singing Hanseroth twins for backup, a four-piece string section, driving guitars and rhythm section, Brandi Carlile’s set offers up tender ballads, soulful lyrics, complex arrangements, searing roots rock — something for everyone. Brandi Carlile in Concert - A Bluegrass Underground Special airs Friday, August 3 at 10 p.m. on WXXI-TV.